As the official unveiling of the Galaxy S9 series inches closer, more and more information about the devices and its accessories are leaking online. After alleged press renders of the phone, seemingly official cases, Dex Pad, etc., the new fast wireless charger (EP-N5100) that is supposed to be announced along with the Galaxy S9 series has also made its way online through a user manual published by Samsung. 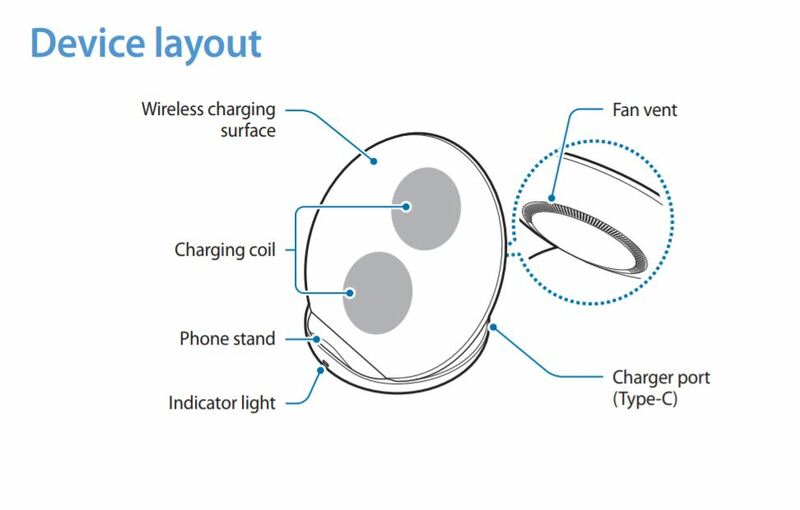 Based on the information and images in the manual, it seems the wireless charger will not differ much from its predecessor in terms of both design and functionality. The new wireless charger will be slightly thinner and flatter compared to the previous model while retaining the same form factor. It also retains the fan to keep the device cool when charging. The fan starts automatically to ensure active cooling when the device reaches higher temperatures. On the technical side of things, the new wireless charger seems to include only two coils stacked on top of each other instead of three in the earlier model. According to the FCC documents, it supports 9 volts and 1.67 amps maximum input power, giving the charger a theoretical capacity of 15 watts. These numbers match with those of the current EP-PG950 model sold by Samsung, and thus negates all the rumors we have heard so far about the wireless charging on the Galaxy S9 being faster than the current Galaxy flagships. The new wireless charger is expected to be available in black and white colors at an approximate price of around €75 (~$90). The device should be announced along with the Galaxy S9 series on February 25 in Barcelona, Spain. Edit: We found the FCC documents for the EP-N5100 model and corrected the maximum power input numbers accordingly. The earlier version of this article mentioned the theoretical capacity of the new charger as 18 watts. So a subtle update to last years convertible wireless charging stand then? All the Samsung wireless chargers I’ve used have been very unreliable. They charge sometimes and sometimes they don’t. After waking up in the AM to discover that my phone didn’t charge overnight, I finally stopped using all of them. I have four (two stands and two flat ones) and all four work as expected – the oldest one I’ve had for nearly two years and no issues with any of them. One thing to note is that you should use the Samsung power supply with them as they don’t seem to work OK with another QC 2.0/3.0 power supply. A lot of money for a wireless charger. I know “official” ones usually are expensive, but it’s getting a bit silly. especially when the design is basically exactly the same, and even a downgrade with the less coils. You can usually find these on sale (in the US around Thanksgiving). Last year I got two at $25 each. So should this new wireless charger also charge the S8/S8+ faster?